A bill introduced by two Republican senators could be signed "within days," Gov. Bruce Rauner said. CHICAGO — Gov. 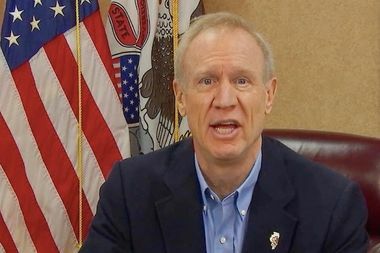 Bruce Rauner said Thursday he would give Chicago schools $215 million to close its budget deficit — if state lawmakers pass a newly introduced bill that alters the state's pension system. A previous version of the bill — introduced by two Republican lawmakers — came within four votes of approval with significant support from Democrats in the General Assembly, who have been at loggerheads with the Republican governor for more than two years. Without changes to the state pension system, Rauner said giving Chicago Public Schools additional financial help would be "a bailout and unfair to Illinois taxpayers." Rauner said the reforms contained in the bill would "save the state billions" and called for the General Assembly to take "swift action." The bill would allow workers to opt for lesser benefits in return for raises after retirement. The legislation would also allow newly hired workers to be put into a 401(k)-style defined-contribution plan rather than a traditional pension. The bill would also allow employees the option of cashing out their pension benefits at once. "This is a compromise we can all get behind," Rauner said in a video message released Thursday afternoon. On Wednesday, Mayor Rahm Emanuel said he was happy the legislation's additional money would allow Chicago schools to make ends meet this year. However, it would not address the larger problem with how the state funds schools. "That to me does not sound like a full agreement,” Emanuel said. John Patterson, a spokesman for Senate President John Cullerton, echoed Emanuel's concern. The legislation would require public sector employees to give up "pension benefits in return for a one-time fix for CPS and no guarantee the state will offer the same assistance next year or any other year," Patterson said. Illinois picks up a greater share of the bill for teacher pensions in school districts outside Chicago than for Chicago's teachers. An effort to reach an agreement on a state budget as well as changes to the state's pension system — the so-called "Grand Bargain" — has failed twice to win enough votes to pass the Illinois Senate. The other proposal floated by Rauner would give Emanuel the one-time authority to transfer money from tax increment finance districts across the city to CPS. Emanuel has called that proposal "half-baked" and a non-starter. The $129 million CPS budget deficit — created when Rauner vetoed a bill in November that would have given Chicago's schools $215 million to help pay its pension bill — threatens to force officials to end the school year on June 1 — 20 days early. Rauner said Cullerton broke a compromise signed last June that allowed schools to open in September. Part of that deal promised more money for Chicago schools in return for statewide "pension reform," a long-held goal of the governor. CPS must pay its employees' pension fund $721 million by June 30. In February, five families sued the state on behalf of CPS, claiming that the state has violated the civil rights of their children by giving Chicago public schools less funding than other school districts. School districts outside Chicago are 58 percent white. The Chicago Public Schools system is 38 percent black, 47 percent Hispanic and 10 percent white. Unless Chicago's schools get more state money, CPS officials have said they will end school early to save $91 million. CPS would save another $5 million by canceling summer school for all students except those in high school, officials said. CPS lawyers have said they will make a final decision May 1 on when the school year will end. Even with the additional state money, CPS will "have to borrow hundreds of millions" to pay its bills, according to the court filing. Claypool has declined to say how much CPS would have to borrow. In January, Claypool ordered four unpaid furlough days for all CPS employees to save $35 million. He also canceled professional development events for its central office staff to save $5 million and slashed charter school budgets by $15 million by the end of the year, officials said. In February, Claypool cut another $31 million by freezing a portion of schools' discretionary funds, which can be used to purchase textbooks and technology and pay for after-school programs, field trips and hourly staff. Those cuts leave a deficit of $129 million, officials said.